Antique oak filing cabinet. 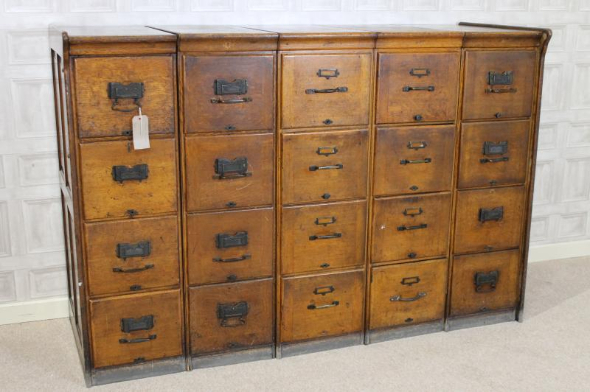 A fantastic opportunity to buy a large bank of 1920s solid oak filing drawers. The bank splits into five individual sections with side panels, so can be easily dismantled and reassembled in various rooms. This piece has recently been acquired from a large University where it has been in use for the past 80-90 years. As you can clearly see from the photos, they are in fair condition for their age. All drawers run smoothly, but there are some card holders and handles missing. In some of the drawers, there are some suspension file holders which have been added (these can easily be removed as they just lift out). You are quite welcome to come and view this piece if you would like to.